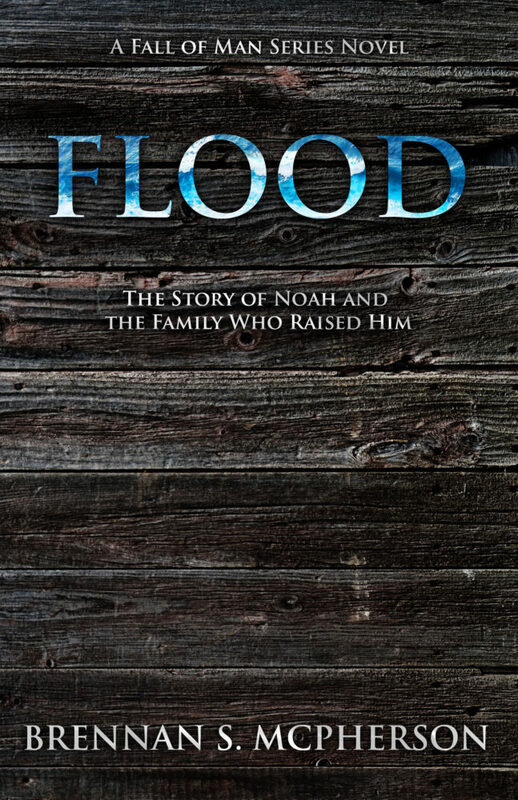 NEW RELEASE Q/A about FLOOD: The Story of Noah and the Family Who Raised Him (Releasing NOVEMBER 8th)! A: A lot! As I was studying the Hebrew text of Genesis to write Flood, I found myself most often wondering about Noah’s family, not him. Which makes sense, because Noah is pretty much the only character drawn in detail, while his mother and father are mysteries, and if Noah had siblings, they are never mentioned. But the Bible claims that Noah’s father, Lamech, died 5 years before the flood, and that his grandfather, Methuselah (the oldest recorded man in history), died the same year as the flood. What was it like for Noah’s family to live during that time period when “every intention of the thoughts of (mankind’s) heart was only evil continually”? To me, that’s an incredibly provocative question. A: Every book in the Fall of Man series is a stand-alone novel. You won’t be confused one bit if you read Flood before anything else. But if you enjoy reading Flood, you’ll pick up little hints and details by reading Cain that will enrich your read of Flood even more, and vice versa. However, if you had to start anywhere. . . I’d encourage you to start by reading Flood. It explains much of what is left a mystery in Cain. A: Though the world was (according to the Bible) much more violent during the time period Flood takes place in, there is less explicit violence in Flood than in Cain, and this new book is less graphic and disturbing. Cain was meant to show the evil nature of violence and how terrible it really is. The book wouldn’t have been as effective without being a bit disturbing. But the message of Flood revolves around forgiveness and bitterness, a completely different theme than Cain. So, in short, no worries. The book won’t make you nauseous. A: Where Cain was cerebral and complex, Flood is easier to read and faster-paced, but it still belongs to the same series, so Flood explores the same ideas, has the same deep character development, contains crazy plot twists you won’t see coming (but that still, remarkably, fit within the boundaries of the Scriptures), and still has the same lyrical prose. Super-duper-early readers have been saying they like Flood even more than they liked Cain. That’s a pretty good sign. A: There was/is. I’ve had a couple friends over the years get so hung up on the details of the global flood that they denied the God of the Bible. They just couldn’t figure out how to reconcile Jesus in the New Testament with what they saw as a genocidal deity throwing tantrums in Genesis 6-8. The weird part is that I think the story of the flood is actually one of the most poignant illustrations of God’s love and mercy in all of Scripture. I love those friends very much, so I wanted to craft a novel that showed how the flood could have been merciful beyond dispute. Because if we can conjure even one scenario in which God could be seen as merciful for sending the flood, can’t we just believe in his goodness? After all, we call it faith for a reason. A: I don’t want to ruin the surprise but. . . yes. And I’m extremely excited about it. Don’t worry, it makes perfect sense—just wait to read the book and you’ll see what I mean. A: Very. It’s also scary. Because if you mess anything up, you’ll have people reaching for their pitchforks and cherry bombs. At times, it can feel a bit claustrophobic to have to work within the confines of a historical narrative. At the same time, boundaries inspire creativity, and there’s enough ambiguity in Genesis to allow for some CRAZY plot twists and mind-bending concepts. It’s been extremely fun, and so far, readers have been saying they can’t put Flood down. Don’t think you know the story! Because it certainly will surprise you—in a good way. A: Two big projects. 1. A super-secret awesome-sauce new series that I can’t wait to announce. Part of what makes this series so awesome-sauce is that it involves other authors! Authors you probably know and like. 2. The third book in the Fall of Man series is going to be based on the story of the tower of Babel. Both the new series and the third book in the Fall of Man series are planned for release in 2018. In other words. . . I’m cranking away at developing the story even while waiting for the edits to come back on Flood. A: Glad you asked! The e-book and paperback versions will be released November 8th, and the e-book will be $2.99 until November 13th, at which point the price will double, so early birds catch a huge deal. The paperback will not be available for pre-order, but it will be up for purchase by November 8th. A: Light roast or death!